With more than 200 new features, Tiger is overflowing with goodies. But most people will never open some of the most interesting ones. 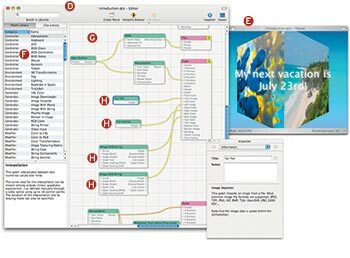 You’ll find Core Image Fun House and Quartz Composer tucked into Apple’s Xcode developer suite. 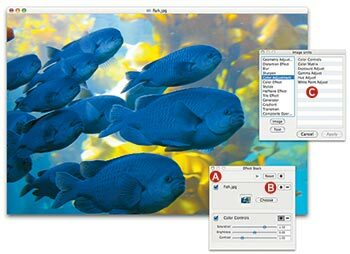 These programs tap Tiger’s powerful graphics abilities, letting you apply live, editable effects to digital photos, and even design your own screen saver. No Adobe Photoshop required. I’ll show you how to use the Core Image Fun House and Quartz Composer tools to create a screen saver that reminds you of your annual vacation to a tropical destination, for example. All you need are four snapshots and the Mac OS X installation DVD. On the DVD, open the Xcode Tools folder and double-click on XcodeTools.mpkg to install the tools. When that’s done, go to the root directory of your main hard drive and look in the Developer folder. You’ll find the apps in /Developer/Applications/Graphics Tools. Core Image Fun House lets you quickly apply effects to your images. And since the effects are all nondestructive, you can play around without causing irreparable damage to the original image. Step 1 Launch Fun House and select one of your vacation images in the Open dialog box (see “Welcome to the Fun House”). The Effect Stack palette ( A ) works like Adjustment Layers in Photoshop or Photoshop Elements (if you don’t see the palette, press Command-option-E to bring it up). From here, you can add or delete layers, make adjustments, and toggle layer visibility. But unlike most image editors, Fun House displays layers from the bottom up. Welcome to the Fun House To make the colors of your image pop, add the Color Controls effect to the Effect Stack and drag the Saturation slider to the right. Step 2 Click on the plus sign (+) ( B ) in the top layer. The Image Units palette will appear ( C ), listing your options for effects. To make your vacation pictures colorful and dreamy, select Color Adjustment from the category column on the left, select Color Controls from the column on the right, and then click on Apply. Fun House adds Color Controls to the Effects Stack palette and offers sliders for adjusting Saturation, Brightness, and Contrast. Bump up the saturation to make the colors more intense. Step 3 Repeat step 2 to apply another effect. For example, you might apply the Bloom filter (in the Stylize category) to add a glow. If the default settings are a bit too intense and produce white halos, drag the Intensity slider to the left. Step 4 Save the image to your desktop by selecting File: Save As and choosing JPEG File from the File Format pull-down menu. Repeat the previous steps to adjust and save three more images. If you don’t want to build compositions from scratch, use existing Quartz compositions as points of departure. You can turn any composition into a screen saver by dropping it into your Screen Saver folder. For this project, you’re going to use your Fun House images to modify one that displays text on a rotating cube. That Personal Touch To add your images to the screen saver, delete the Image With String patches, drag your images into the workspace, and connect them to the input ports on the Cube patch. With a few changes, this stock Quartz composition becomes a custom screen saver that‘ll remind you of pleasures to come. 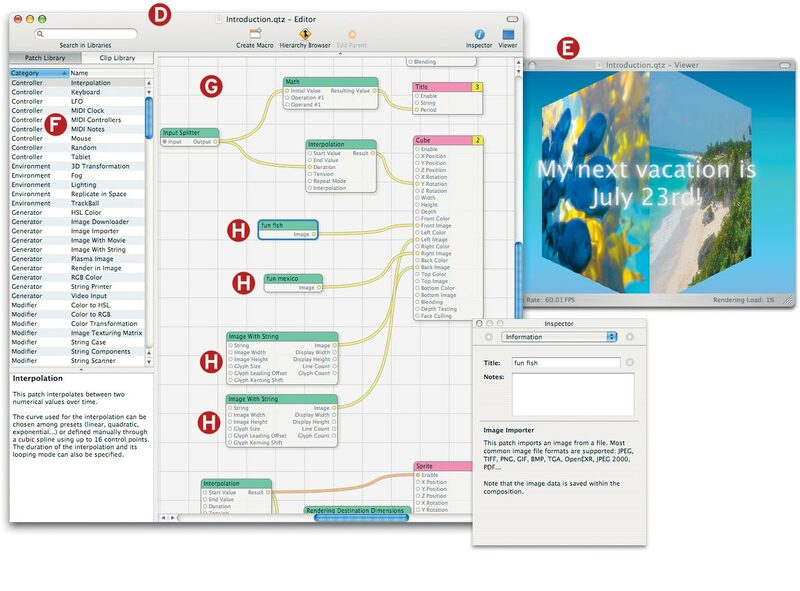 Step 1 When you launch Quartz Composer, you’ll see the Quartz Composer Assistant pane, which lets you select from a handful of templates. From the Finder, navigate to the /Developer/Examples/Quartz Composer/Motion Graphics Compo-sitions folder and double-click on the Introduction.qtz file. Four Image With String patches ( G ) control the cube text. The green titles indicate that these are Processor patches, which process data and pass the results to the pink Consumer patches, which in turn render the results. You connect green and pink patches by stringing hose-like connectors between their ports (indicated by small circles on the patches). Ports pass parameters from one patch to another, telling the composition what to do. Step 2 To replace the cube text with your images, select the topmost Image With String patch by clicking on it. Notice that its Image port connects to the Front Image port of the Cube patch. Since you don’t want text, press the delete key to get rid of the Image With String patch. Step 3 Drag the image you created in Fun House from the desktop into the workspace. An Image importer patch appears with the title of the image you selected. For an explanation of what the patch does, click on it and select Information from the Inspector’s drop-down menu (if you don’t see the Inspector, go to Editor: Show Inspector, or press Command-I). Step 4 Reconnect the two patches by clicking on the Image port in your new patch and dragging your mouse to the Front Image port in the Cube patch. The image will now appear on the front of the cube. If you don’t see it, wait for the cube to rotate around. Step 5 Repeat the above steps to delete the other three Image With String patches and replace them with your images. Be sure to attach an image only to the Left Image, Right Image, and Back Image ports. If you attach an image to the Top Image or Bottom Image ports by mistake, you won’t see them. Step 6 Your cube looks good, but you can’t see the screen saver’s background text. To move it to the front, you need to change the rendering order (indicated by the yellow number) in the top right corner of the Title patch. Control-click on the pink Title patch and select Rendering Layer: Layer 3. Look closely at the Title patch and you’ll notice that its corners are square, whereas the others’ are slightly rounded. This indicates that it’s a macro patch (a patch that contains other patches). To change the text, you’ll need to access its subpatches. Double-click on the Title patch to display the subpatches in their own workspace. Find the topmost Billboard patch and double-click on its Color port. In the Colors palette, choose a color and click on Done. To return to the main workspace, select Edit Parent from the Editor menu or press Command-U. To change the text to something else, double-click on the String port in the Title patch. Edit the text and press return. Step 7 Save your composition by selecting File: Save As. Navigate to / your user folder /Library/Screen Savers and save the file. Go to the Screen Saver tab of the Desktop &Screen Saver preference pane, select the file from the list, and click on the Test button.